In my experience there are two ways to make this beer. 1) Brew an IPA in the US, where more hops is better, then add Belgian yeast and 2) Brew a Strong Golden Ale in Belgium and add hops. I’ve found that I prefer the latter and this beer confirms it. The quality of this beer completely supersedes any US want-to-be Belgo IPA on the market. 50 IBUs. Really? You call that a triple IPA? Founders I3PA is 100+ for goodness sake. While you might think this beer does not boost an impressive hop profile at first glance you would be wrong. Magma comes across as rather under assuming, yet it delivers in all the right places. Appearance is one of the highlights. A golden-copper hue is capped by a dense off-white head that laces like no ones business. Be careful to decant this 11.2 oz bottle. I’ve found that I only got about 10 clean ounces before the sediment starts to pour out (which is chunky). When pouring, you will notice a powerful pleasant aroma that wafts up to greet your nose. The floral, herbal, pungent and resinous hops overpower the aroma. I’ve heard that they use American Simcoe and Cascade and dry-hop this beer so the nose is alive with hops. 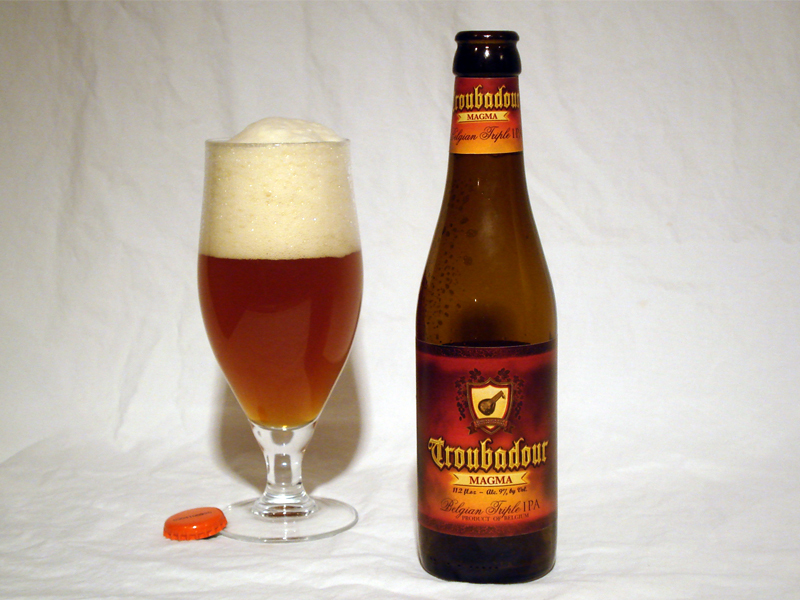 The yeast profile is not as spicy as a Tripel, but rather heavier and mellow. It allows for the hops to shine while at the same time contributing a banana-like aroma. It took a few sips to taste anything else other than the hops. However, the interplay between the hops and yeast was intricately complex and intertwined. I’ve often found that with US variations of a Belgian IPA you can easily distinguish the hops and then later isolate the yeast. Here, both work together and are supported by a moderate malt bill which leaves a toffee rich aftertaste. Almost like a flash in the pan, the hops give off a dry, palate coating bitterness and then vanish. This effect beckons another sip that starts the cycle over again. I really enjoyed this beer and think it out did my expectations. If you like Belgian strong ales and hoppy beers you might want to put down the Stone, Green Flash, or New Belgium and grab Magma instead.